Over the past few years aerospace 3D printing has really been taking off, and especially NASA is seeming to use this technology in just about every aspect of their Mission to Mars – from prototyping, to in-space parts manufacturing and even to manufacturing actual engine parts to send spacecraft into space. And they seem to be particularly successful in that latter goal, as they have just tested a completely 3D printed rocket engine. During the successful tests, the engine used cryogenic liquid hydrogen and oxygen to produce 20,000 pounds of thrust. It thus seems that the future of 3D printing in space exploration is ensured. NASA has previously extensively discussed the advantages of the technology, especially as a cost-saving tool for lengthy exploration missions. That does require, however, a technology capable of producing vital spacecraft parts and that is what these tests are all about. 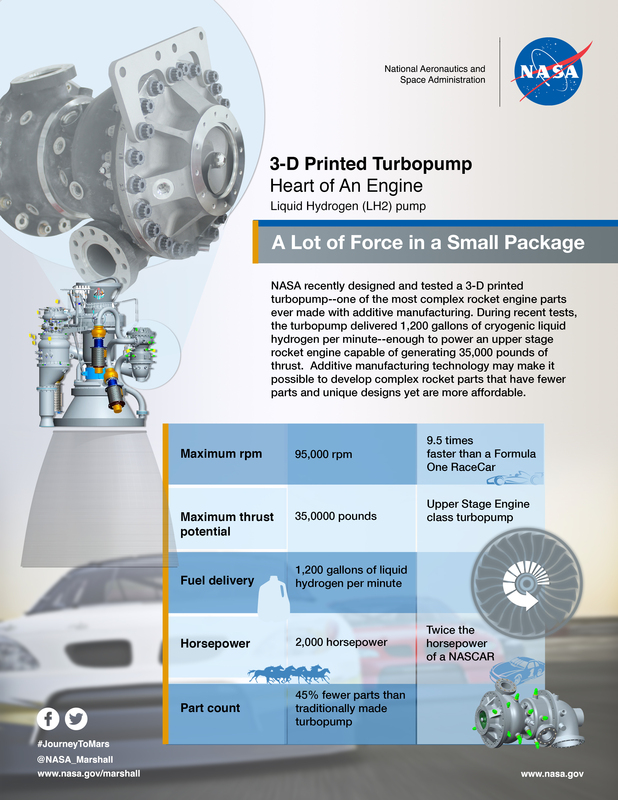 NASA previously tested a 3D printed turbopump for rocket propulsion, at the same test facility at their Marshall Space Flight Center in Huntsville, Alabama. And as you can see for yourself in the clips above and below, these tests were impressive to see. In total, seven tests were performed – with the longest lasting 10 seconds. During all tests, the 3D printed engine was exposed to the same extreme conditions as it would be inside a flight rocket engine (where fuel is burned at temperatures higher than 3,315 degrees Celsius). The previously tested 3D printed turbopump was used to deliver the fuel (liquid hydrogen), cooled down to below -240 degrees Celsius. During these tests, both cryogenic liquid hydrogen and liquid oxygen were used, both of which are propellants common in spaceship propulsion systems. While these might not be used to go to Mars, they do produce the same extreme temperatures and erosion effects as the alternative (methane and oxygen – which might be producible on Mars). In particular, parts suffer from embrittlement caused by the extreme conditions, so the 3D printed components need to be durable enough. Tests with methane and more 3D printed parts, such as a cooled combustion chamber and nozzle, are already planned. “These NASA tests drive down the costs and risks associated with using additive manufacturing, which is a relatively new process for making aerospace quality parts,” said Robertson. “Vendors who had never worked with NASA learned how to make parts robust enough for rocket engines. What we’ve learned through this project can now be shared with American companies and our partners.” Fortunately, all parts performed as expected during all seven tests. Of course all these parts are manufactured with state of the art 3D printing equipment, meaning selective laser melting technology. While a cost-effective tool, it is also already proving to make parts more efficient as well. The 3D printed turbopump on this engine, for instance, consists of 45 percent fewer parts than a traditionally made alternative and includes features that would have been impossible to make otherwise. It’s also proving to be very quick – valves that would take a year to produce are now being realized in just a few months. It is therefore expected that 3D printing will take on an increasingly important role in the NASA development process. “This new manufacturing process really opened the design space and allowed for part geometries that would be impossible with traditional machining or casting methods,” said David Eddleman, one Marshall’s propulsion designers. “For the valve designs on this engine, we used more efficient structures in the piece parts that resulted in optimized performance.” While there is still quite a lot of work to be done on this breadboard engine, which needs to be scaled down and made even more efficient before being ready for use, things are looking good. For more information on NASA’s material performances, go to their MAPTIS system here (access will need to be requested).